International Pop Music special, Japanese Night in Klunkerkranich! This month,a bit different! Its is going be mixture of J-classic Pops, J-Psych, J-New Music, Butoh with Iwazu Mo Gana show! All music are Japanese and the Musical Dance performance by Berlin based Japanese performers!! And Special DJ Kazuo Tsubouchi from Sundays & Cybele/シベールの日曜日 for Japanese　psychdelic music, and Chika Takahashi for Japanese new music! Its started inn Berlin, 2014 as an experiments to mix Traditional and Experimental performance by Taishi Nagasaka(DJ ONONiiONIONIION,Jaguar No Me,,Cozmik Onion Express,ex-Fat White Family), Kiyoshi Fujikawa (Tau,Fujin Raijin).Taishi sings non word melodies and manipulates/triggers the Djambe with his analog synths,and Kiyoshi plays a soulful Djambe.They have invited Berlin based Michiyasu Furutani(ex-Shibusa Shirazu,Butoh),Hibiki Ishikawa(Tsugaru Shamisen) and Daiyoshi Kizan(Shakuhachi Master). 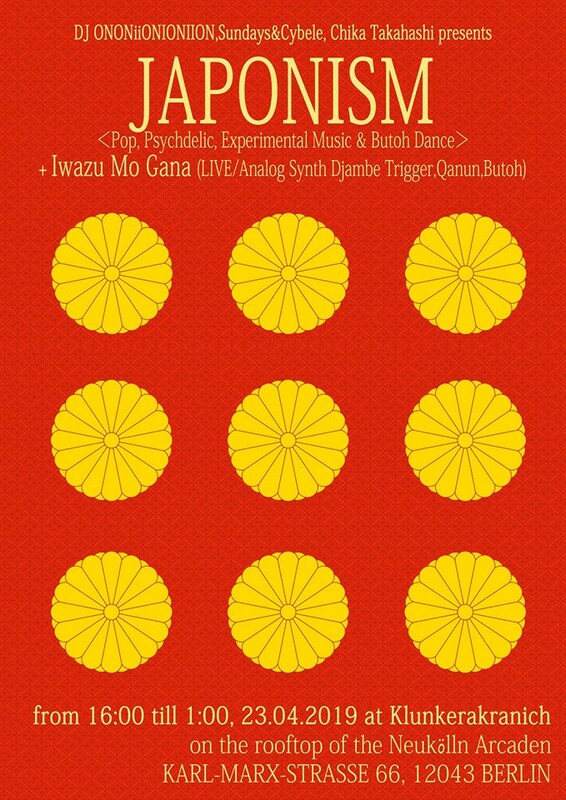 This time, they will invite a Butoh dancer, Shimo (ex-Shibusa Shirazu) ,Shingo Ali Masuda (Qanun,arabic instrument). A performance artist, singer and all-around huge stage presence from Japan. In her short time in Berlin, Chika has already hosted some of the city’s most reknowned karaoke events and has become a vital and prominent member of performance group, Bad Bruises (The House of Red Doors). aka Taishi Nagasaka, is a Berlin based classic J-Pop Vinyl collector/DJ/musician/Event organiser,who has been through world music, experimental music etc. He has his own bands in Berlin, Jaguar No Me, Iwazu Mo Gana, Cozmik Onion Express etc.